Crews are facing challenges keeping up with pothole repair in the area. BALTIMORE, Md. — You could call it a crash course in repairing potholes, and it all begins with clearing out the water. Water, after all, is the main culprit in creating a hole in the road in the first place. 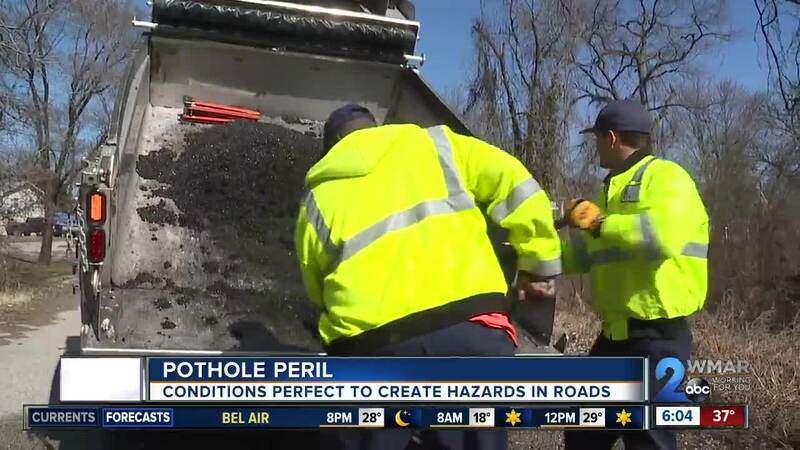 "It's a combination of things,” said Jim Small, a superintendent with Anne Arundel County’s Department of Public Works, “It's the freezing and thawing... the excessive rain we've had, which is not helping, because it's actually coming up through the asphalt. It's pushing the asphalt up now where it never used to. We've had almost six feet of rain in less than a year." Filling the pothole comes next, and this time of year, that too can be a problem. "During the winter months, the asphalt plants generally shut down for maintenance, so we've been having a hard time getting hot mix,” said Small, “So right now what we're using is a cold mix product that's just a temporary patch." The potholes more resemble craters in I-295 just below Route 32 where the state has reduced the speed limit until repairs can be made, but just because they're in Anne Arundel County doesn’t mean it’s the county's responsibility to fix them. "We would like to remind residents that if a street has a number associated with it, that's the responsibility of the state," said DPW Spokesman Matt Diehl. On average, the county gets 35 calls about potholes each week or 1,800 per year, yet it fixes 11,000 of them. "Usually, we'll get a request for one pothole, and when we go out there we find 10, 15 or 20 other potholes in the area," added Small. A challenge for those charged with repairing the roads, as the weather continues to take a toll on them.